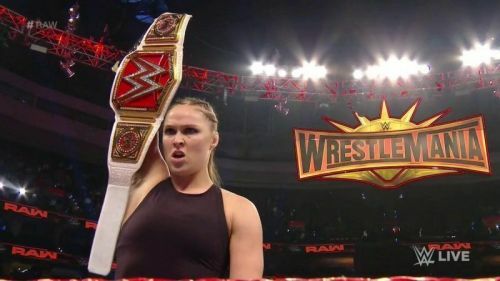 Ronda Rousey took on Dana Brooke for the RAW Women's Championship, this week. As one would expect, the self-proclaimed baddest woman on the planet won the match in no time at all. However, it was after the match that she began striking security, even having her husband get involved in the fiasco. Since then, she's sent a Tweet out, challenging WWE to fire her and insisting that she cannot be controlled by them. Ronda Rousey has turned heel, dropping her whole smiling babyface routine for an aggressive and violent attitude. She is scheduled to take on Becky Lynch and Charlotte Flair in a triple threat match at WrestleMania 35. This week on RAW, security tried to interfere after she would not let go of Dana Brooke's arm. Her husband, Travis Browne also knocked a security guard out during the melee that ensued. It will be interesting to see whether he gets involved in the storyline as well. Ronda Rousey was not apologetic at all about her actions and sent the following Tweet out, challenging WWE to potentially fire her. She mentioned that she could not be controlled either with goons or with money. @wwe can fire me whenever they want. They can’t control me with this job. @wwe can’t control me with hired goons. @wwe can go ahead and fine me however much they want. They can’t control me with money. There have been mixed reactions to Ronda Rousey's change in character, with some people thinking that this is the persona she should have adopted all along while others have been critical of it. It just seems like Ronda Rousey will prove to be a thorn in Stephanie McMahon's side for the foreseeable future. One wonders if the Rousey-McMahon rivalry will turn out to be like Austin-Vince. I'm sure there will be punitive measures undertaken next week. Things are bound to pick up on the road to WrestleMania 35. Maybe she does get fired, in storyline at least.